It was like a Hollywood script: an underdog team, a chassis from an unproven designer, and the first flash of genius from a champion-to-be. Ayrton Senna's '84 drive through the field at a pouring wet Monaco in his Toleman, to wrest first place from another champion-in-waiting, Alain Prost, only to be denied his first victory by a red flag, was the beginning of a legend. 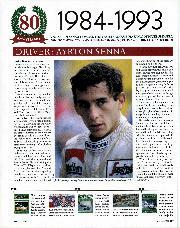 But Senna didn't have to be in such a hurry; the stream of wins and the world championships were on their way. The same went for that young designer. Rory Byrne made his mark at Toleman and, when the team became Benetton in 1986, went on to design the cars that took Michael Schumacher to back-to-back titles in 1994 and '95. From there, he followed Michael over to Ferrari as chief designer, part of the perfect team which has since rewritten the record books. But Byrne's first scent of victory came with that harbour-side epic at Monaco. After that remarkable season, the car itself was passed on to Stefan Johansson, who'd driven it as a sub for Senna, then as his team-mate. Since the Swede climbed out of it after the 1984 Portuguese GP, it has barely turned a wheel. 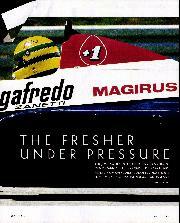 It is in exactly the state it was when Senna splashed through that disbelieving field 20 years ago. The place is almost perfect. Alright, Donington is not exactly Monaco; but the chances of test-driving a Formula One car there are rather limited. And Donington is an important place for Senna history: it was here that the Brazilian had his first run in an F1 car in 1983; 10 years later he won the only world championship GP ever held here. Today, another piece of Senna history is waiting in the paddock: Toleman TG184, chassis 02. The Monaco car. It was on the 32nd lap of a chaotic race when it happened: Senna overtook Prost's McLaren to take the lead. A rookie, in a Toleman-Hart, on the verge of an amazing victory. 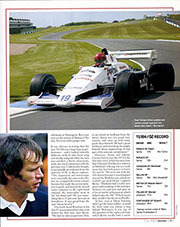 Then clerk of the course Jacky Ickx red-flagged the race. Results were backdated to the last completed lap: Prost first; Senna second. It was an unsatisfactory end to the first duel between two drivers who would rule F1 for almost a decade. Senna was mortified, but at least now he was known around the world. Before Monaco he had been rated as 'highly talented'. Now he was a potential champion. 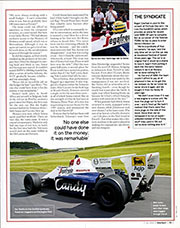 At that time, businessman Ted Toleman's team was looking back on a short and eventful F1 history. Encouraged by winning the 1980 European F2 title, it had stepped up to the grand prix stage. The first season was a disaster: only twice did a Toleman qualify for a race in 1981. Three years later, the British outfit had melded into a team that consistently scored points. The reasons for its rise: Brian Hart had dramatically improved his turbo 'four pot', and designer Byrne had delivered a capable, modern chassis —TG184. Oh, and Senna. Typical for a GP car of the time is its far-forward driver position — and narrow cockpit. Johansson's old seat is still inside it. 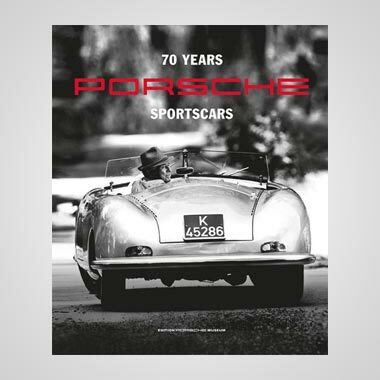 "The car hasn't been driven in anger for 20 years," says Roger Cowman, ex-Formula 3000 team owner and part of the Shottle Syndicate that has owned the car for the past 10 years (see panel on page 53). There's no way that I'm going to fit, so we remove it and I try again. Now I am sitting on the bare monocoque, but at least I can feel three pedals under my feet. Yes, a true racing car: throttle, brake and clutch. And a proper gear lever. And analogue instruments. And no traction control to step in should the tail step out with 750bhp. Belts on, ignition on. The starter whirrs behind me and the engine bursts into life. 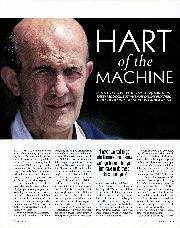 The Hart sounds nothing like a modern F1 engine: it's lumpy compared to the shrill scream of today's V10s. The red line stretches only to 9800rpm. But if you want to drive this car fast, you have to keep what revs there are and the boost way up to avoid the dreaded lag. The last turbo car I drove was this year's Peugeot 206 world rally contender; with 20 years of development over the Hart motor, its power delivery was immediate; in the Toleman you can count 1-2... whoosh! But I won't be stretching it to its limits: without a secure seat you can't take risks. Also the car is for sale, and the owners want to keep it in its original condition, so I'm under strict instruction to treat this precious machine with the utmost respect. And the car is wearing wet tyres on a dry day. A reminder that I am not to try too hard. Still, there are more than enough intense impressions: the Toleman seems to follow every bump. Even on the straights I have to work hard to keep it tracking true. Surprisingly, the steering is easy to handle without too much effort. The Hewland five-speeder 'box shifts with precision, the clutch is not that heavy, and the brakes, metal, not carbon or ceramic, work with dramatic power. Sure, I can handle a nice relaxed cruise with this Toleman on a sunny afternoon at Donington. But a wet race on the streets of Monaco? No way. Not even with a proper seat. It was obvious in testing that the new TG184 was a huge leap in performance — and it looked radically different, with its slim front wing and chunky sidepods. Only the twin rear aerofoil, a Byrne innovation, made any visual connection with the previous year. Underneath, though, it was actually an evolution from the unlovely 183B, as Byrne explains: "The suspension and monocoque were essentially the same as the 183, but we scrapped the front venturi because that made the car too sensitive to pitch, and moved the oil and water radiators to the right-hand sidepod; the intercooler went in the left-hand pod. We got something like a 25 per cent increase in downforce. It was good from the start. Senna loved it." The fresh-faced Brazilian in his first F1 season proved his value even before his first race, says Byrne: "We had no data acquisition then, so we relied on feedback from the driver. Senna was very good, very concise, and came up with some good ideas himself. He had a good technical understanding; he taught himself about engineering. It was part of his immense commitment." However, Senna and Johnny Cecotto had to race the 183 for the first four races. It had become clear that Toleman's Pirellis were inferior to Michelin's offering, but as a small team they had little power to hurry the switch. "We were late with the 184 chassis because it was designed around the Michelin tyre, which we couldn't get until Dijon," explains Byrne. 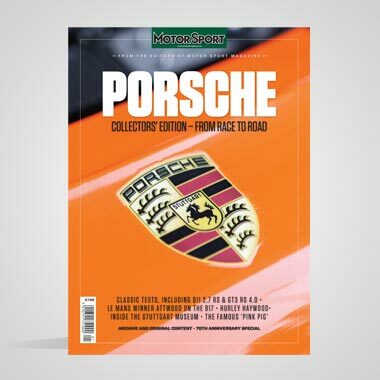 "Michelin had a really very good understanding of the interface between car and tyre and gave us a lot of useful information which helped tune the 184." Which meant they couldn't run the car on Pirellis. In fact, even at Dijon Toleman didn't get the latest rubber; as small fry their issue was always a step behind McLaren's. It was one of the penalties of the tight cash flow, which Byrne recalls with a smile: "We were always working with a small budget — I can't remember what it was, but we probably have 100 times more at Ferrari!" The team could not afford an autoclave to form the composite structure, or a wind tunnel. But here it was lucky. Byrne: "We had almost exclusive access to the Ministry of Defence wind tunnel, which was at Shrivenham. Although it was an open-jet tunnel, we got a lot of useful work done, so the aerodynamics improved through the season." 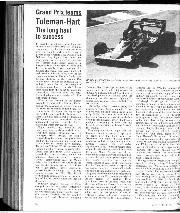 So did the engine, as Hart slowly cranked up the pressure on his compact four. 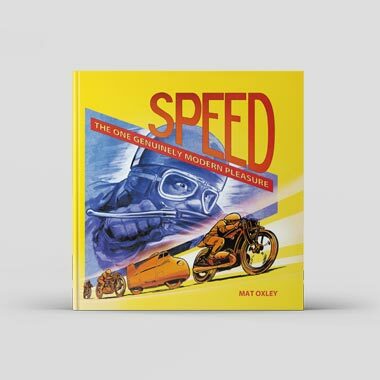 Once he changed to casting head and block as one, boost and horsepower soared. It couldn't match BMW's 1000bhp bombs but, after a series of turbo failures, the 415T gradually became reliable — and was amazingly cheap. "Brian did an incredible job on the budget he had," says Rory. "No one else could have done it for the money; it was remarkable." Senna's sixth place in South Africa and seventh in Belgium, both in the old car on Pirellis, seemed a good omen for Dijon, the first race for the new car. But the highly stressed turbos let Toleman down — both Senna and Cecotto blew up. Monaco was next, where Senna again qualified midfield. Then, on race day, the rains came. It was a crucial circumstance. Michelin only had one type of wet tyre on hand; for the first time both the Tolemans would start on the same rubber as the McLarens and Ferraris. Could Senna have maintained his lead if Ickx hadn't brought out the red flag? 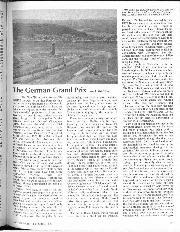 Would Prost have found that valuable extra fraction after being passed? Nevertheless, that performance flagged up a superstar. 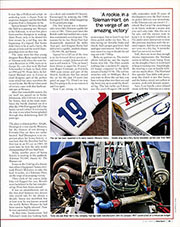 It also triggered a dispute within the Toleman team. 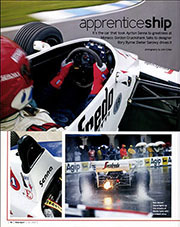 After Cecotto broke both legs at Brands Hatch, Toleman entered a single car for the next three races — in all of which Senna retired. But on the strength of what he had seen at Monaco, Peter Warr of Lotus was negotiating to secure Senna for the 1985 season, and announced the deal at the Dutch GP. Furious that he had not been told beforehand, Toleman's team boss Alex Hawkridge suspended Senna from the next GP, Monza, bringing in Johansson from Tyrrell to take his seat. Even after 20 years, Byrne remains diplomatic about this run-in: "That decision was made by the management; I was not involved. But Stefan did an admirable job in finishing fourth — even though he nearly lost it just after the finish. A right-rear wheel bearing broke up because he'd had a wheel-banging session with someone in the race." When passions had ebbed, Senna returned to work, equipped with a new chassis, while Johansson took over chassis 2 as his team-mate. The rest of its history is hardly dramatic — an 11th place in the final round at Estoril — but what makes this a historic machine is the part it played in making two reputations: one driver, and one designer.